What Time Management Skills do you need to help you feel like you have more hours in the day? We believe there are 4 core time management skills you need to develop. These skills are like a foundation. There are other tools and techniques that you will use depending on your personal style and preferences. We strongly advocate that you need to create your own system or structure that suits YOU. What is best for you may be very different from what suits your friend, your boss or your parents! Remember to check out the rest of the time management skills. Go to the overview of the core time management skills. Great question. Let's look in some detail as to how these skills help you create more time. What does a trigger have to do with finding more time? Heaps! One of the biggest challenges people face when trying to use a structure is to remember to use the structure. This is where I have found a trigger makes a massive difference. This is such a simple step and it is also easy. I believe it is a gem in that it is a simple and easy step that gives massive "return on effort". It clearly fits in to the 20% of high impact actions based on the 80-20 rule. So what is a trigger? It is something you already do pretty much automatically, that you link to your time system. Obviously this depends on what your system is as to what you might use as a trigger. The most common tool for creating a structure is a diary (when we use the word diary below it also refers to any tool or system you use to manage your time). People who have not a diary regularly struggle to remember to use and refer to the diary every day. * Put your car keys on your diary. * Put your wallet with your diary. * Put your mobile phone with your diary. * Put your diary on your clothes/shoes. * Put your diary under your PC mouse. When our clients start to use a trigger they find that they use their time management system much more and therefore they feel much more in control of their time. Take a minute to think about something that you always have with you or on you. Something that you just automatically collect and take with you where ever you go. Go and get that item now AND get your diary too. Put them together physically. Keep them together. Your diary now goes everywhere your other item goes. May you experience life slowly! Remember to check out the rest of the core skills to improve time management. 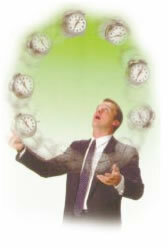 Go to the overview of the core time management skills.